The first grouping of parameters are for “Time Frame”. A one year time frame is shown by default, but for option trading 3 months is a more convenient choice. And the frequency is left in the Daily setting mode. Indicators is the next grouping to be modified. “Moving Average” is set to SMA and the time to the right of the SMA box is set to 20. The use of the 20 day moving average compared to the actual stock price enables us to assess if the stock is in an uptrend or downtrend. Upper Indicator is set to Bollinger Bands. These bands show the one sigma stock price range. They can be used with stock volume to assess if a new price trend is being established or just a reversion to the norm, which is the 20 day moving average. Some traders use high volume penetration of a band for initiating a long call or put trading opportunity. Chart indicator “Lower Indicator 1” is left at Volume, which is the default setting. “Lower Indicator 2” is set to MACD, which is an oscillator used to determine price trend also. The “Chart Style” group is used to change the price display. We use the default settings for price and background. But change the chart size to BIG for easier reading of the display. Under the Chart Size setting is a red Draw Chart button, click it to implement the changes. Under the Draw Chart button there is a link called “Store Chart Settings” which will allow you to store the changes. Click “Store Chart Settings” and answer the pop up questions OK and OK. Each time a chart is call for in Power Options these new chart settings will be applied. 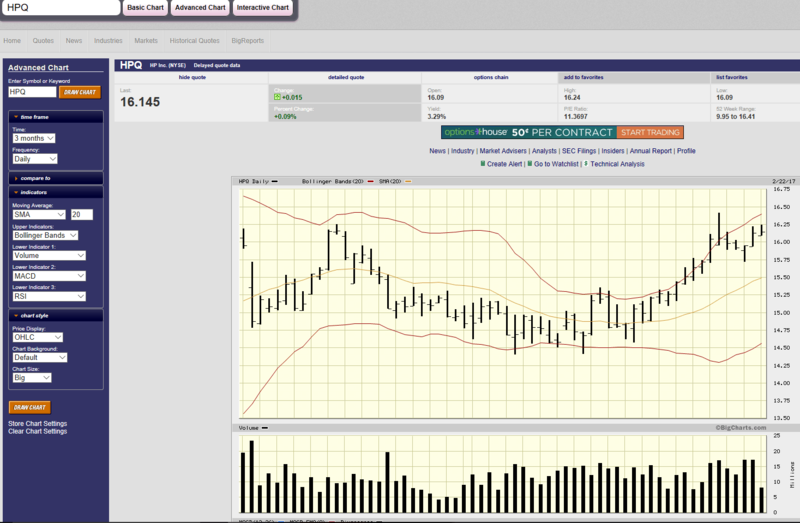 After changing the default settings, you will have a much more user friendly stock chart for the option trader.